Under normal conditions, the processes shown in Figure 3.2 are tightly coupled, so that the oxidation of metabolic fuels is controlled by the availability of ADP, which, in turn is controlled by the rate at which ATP is being utilized in performing physical and chemical work. Work output, or energy expenditure, thus controls the rate at which metabolic fuels are oxidized, and hence the amount of food that must be eaten to meet energy requirements. As discussed in section 5.3.1, metabolic fuels in excess of immediate requirements are stored as reserves of glycogen in muscle and liver and as fat in adipose tissue. 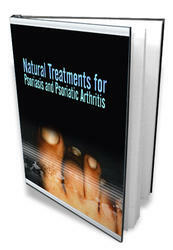 In all of the reactions in which ATP is utilized, what is observed overall is hydrolysis of ATP to ADP and phosphate. 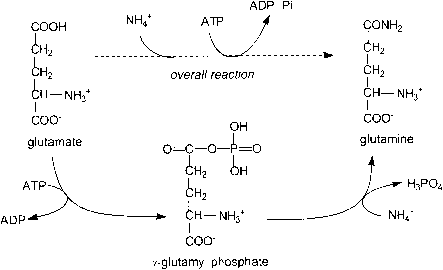 However, as discussed below, although this is the overall reaction, simple hydrolysis of ATP does not achieve any useful result; it is the intermediate steps in the reaction of ATP + H2O ^ ADP + phosphate that are important. Figure 3.1 The adenine nucleotides (the box shows the structures of adenine, guanine and uracil; guanine and uracil form a similar series of nucleotides). Figure 3.2 Linkage between ATP utilization in physical and chemical work and the oxidation of metabolic fuels. exothermic, and the equilibrium of the reaction ATP + H20 ^ ADP + phosphate lies well to the right. 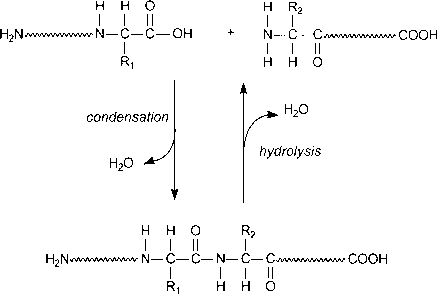 Linkage between the two reactions could thus ensure that the (unfavoured) endothermic reaction could proceed together with overall hydrolysis of ATP to ADP + phosphate. 1 Phosphorylation of the hydroxyl group of a serine, threonine or tyrosine residue in the enzyme (Figure 3.3), thus altering the chemical nature of its catalytic site. As discussed in section 10.3, phosphorylation of the enzyme is also important in regulating metabolic pathways, especially in response to hormone action. 2 Phosphorylation of one of the substrates; as shown in Figure 3.4, the synthesis of glutamine from glutamate and ammonia (section 9.3.1.3) involves the formation of a phosphorylated intermediate. 3 Transfer of the adenosyl group of ATP onto one of the substrates, as shown in Figure 3.5. The activation of the methyl group of the amino acid methionine in methyltransfer reactions involves formation of S-adenosyl methionine (see also Figure 11.22). Figure 3.3 The role of ATP in endothermic reactions — phosphorylation of the enzyme. Figure 3.4 The role of ATP in endothermic reactions — phosphorylation of the substrate. 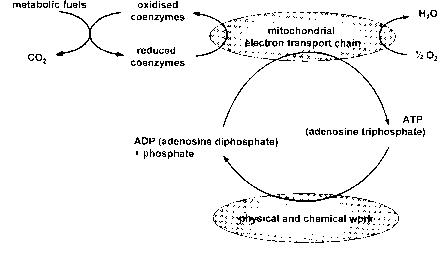 in cells is kept extremely low by rephosphorylation to ATP, linked to the oxidation of metabolic fuels (section 3.3). Again, this serves to ensure that the equilibrium of the reaction ATP + H2O ^ ADP + phosphate lies well to the right. In a number of cases, there is a further mechanism to ensure that the equilibrium of an ATP-linked reaction is kept well to the right, to such an extent that the reaction is essentially irreversible. 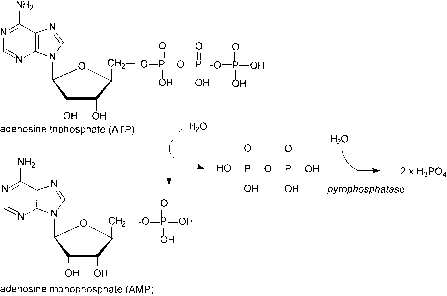 The reaction shown in Figure 3.6 results in the hydrolysis of ATP to AMP and pyrophosphate. There is an active pyrophosphatase in cells, which catalyses the hydrolysis of pyrophosphate to yield 2 mol of phosphate, so removing one of the products of the reaction, and ensuring that it is essentially irreversible. Figure 3.5 The role of ATP in endothermic reactions — adenylation of the substrate (see also Figure 11.22). Compounds that are lipid soluble will diffuse freely across cell membranes, as they can dissolve in the lipid of the membrane — this is passive diffusion. Hydrophilic compounds require a transport protein in order to cross the lipid membrane — this is facilitated or carrier-mediated diffusion. Neither passive nor facilitated diffusion alone can lead to the concentration of the transported material being greater inside the cell than outside. Concentrative uptake of the material being transported may be achieved in three main ways: protein binding, metabolic trapping and active transport. These last two mechanisms are both ATP dependent. In the case of a hydrophilic compound that enters the cell by carrier-mediated diffusion, a net increase in concentration inside the cell can sometimes be achieved by binding it to an intracellular protein. Only material in free solution can equilibrate across the membrane, not that which is protein bound. Such binding proteins are important, for example, in the intestinal absorption of calcium (section 4.6.1) and iron (section 4.6.2). Hydrophobic compounds are transported in plasma bound to transport proteins (e.g. the plasma retinol binding protein; section 11.2.2.2) or dissolved in the lipid core of plasma lipoproteins (section 5.6.2), and net intracellular accumulation to a higher concentration than in plasma depends on an intracellular binding protein that has a greater affinity for the ligand than does the plasma transport protein. Active transport is the accumulation of a higher concentration of a compound on one side of a cell membrane than on the other, without chemical modification such as phosphorylation. The process is dependent on hydrolysis of ATP to ADP and phosphate, either directly, as in the case of ion pumps, or indirectly, as is the case when metabolites are transported by sodium-dependent transporters. In some ion pumps the role of ATP is simple. As shown in Figure 3.7, when the membrane transport protein is phosphorylated it undergoes a conformational change that opens the transmembrane pore and permits it to transport an ion across the membrane. Before the ion can be released at the membrane surface, the transport protein has to be dephosphorylated. What is the functions of atp in metabolism? What are the role of ATP in metabolism?